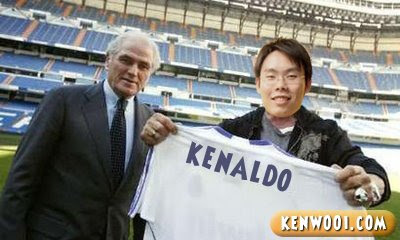 Manchester United have accepted a £10,000 ($14,473 or €11,000 or RM55,000) offer from Real Madrid for Kenaldo Wooi. It’s now certain that a second era of galacticos has begun at Madrid, with news of Kenaldo’s deal coming. 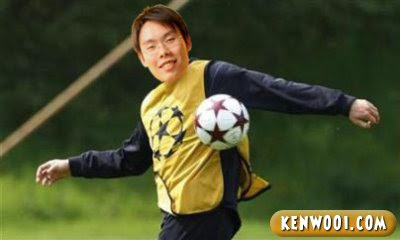 Real Madrid-bound midfielder Kenaldo looks set to become one of the lowest paid sports un-stars in the world. 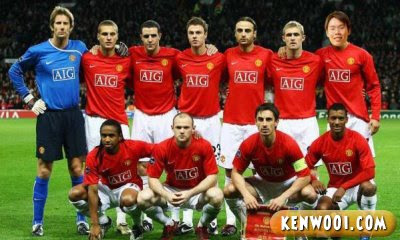 Kenaldo, costing just £10,000 on the transfer board, plays a significant role in the current Manchester United squad. P/S: Sorry Cristiano Ronaldo. Since you’re gone, I’m taking over your body. 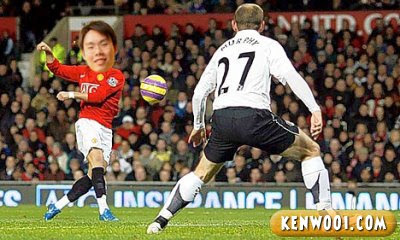 Kenaldo has scored vital goals in the recent English Premier League season. Scoring just 2 goals, which is quite an achievement, throughout the whole campaign has helped Manchester United in winning their 3rd Premier League title in a row. No one has expected Real Madrid to be attracted by Kenaldo’s awesome talent and Sir Alex Ferguson once said “Kenaldo is good but no top teams will buy him. If Real Madrid is interested, I’ll certainly sell that mob this virus!” in December 2008. And the gaffer’s statement is about to come true. The 21-year-old is expected to sign a seven-year contract at the Bernabeu, which means by the final year he would be on £52,000-a-year or £1,000-a-week. When converted into Malaysian currency, Kenaldo will be earning RM5,500-a-week – which is reportedly higher than what the average Malaysian earns. Kenaldo, who celebrated his move by partying the night away in Kuala Lumpur, is currently on holiday and told Malaysia’s radio station Fly.FM host Phat Fabes that he was “flattered” by Madrid’s interest. He has also revealed his pride at being the subject of an “awesome” £10,000 bid from Real. Here’s a brief introduction about Kenaldo Wooi. He has been playing football since young. His talent caught Sir Alex Ferguson’s attention in a local football match and therefore got signed up as an amateur player in Manchester United. With much effort by the young lad, he has made a promising start to his football career. 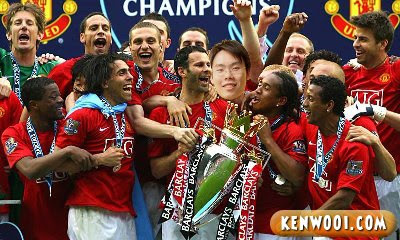 kenwooi.com wishes Kenaldo Wooi all the best in his £10,000 move to Real Madrid. P/S: It’s definitely more worth it than Cristiano Ronaldo’s transfer fee. I thing Ronaldo should be gone sooner or later. He is good player…not great. But the problem is…he just isn't committed! Well…good bye and MU certainly can make use of the their new cash right? that's super duper cool man! u must hv been spending quite some time in editing those pics… great job! muahahahah!!! bro, u r superb humour la!!! I like it!!! Omg this post is funny, RM5,500 Kenaldo!! I love u kenaldo!! as long as u dont score own goal! haha. May Kenaldo have a good time in Real Mad-rid. Yah lah, this ronaldo thing is so much talk right now in the press. Dude, I din know you could kick a ball. LMFAO. Which "club" sold you for 10k? as a football fan, i really enjoyed your post. LOL since you're kenaldo, maybe i can call myself keonaldo. *cool* how did u edit your PHOTOS…coollll :D tell me,will you? The new era of soccer/football art? Kenaldo?! Haha. U are damn funny lar. Very good in editing, I like your pics! You must be a real football fan, right? SO RETARDED LAR UR FACE!! all also same facial expression wan..
OMG, should I Digg this post? As a Manchester United fan, I feel happy Ronaldo had finally left for Real Madrid. We dun want a player whose heart is not with the team. Must have scored 2 'vital' own goals. Susah lar Bro..We still want ManU to continue winning matches.